Art thrives in the Highland Lakes. If you have any doubt, walk down Main Street in Marble Falls and take note of the sculptures. The pieces are part of Sculpture on Main, an outdoor art display that began in 2007. The sculptures are rotated in and out on a biennial basis with the next installment this fall. The nonprofit Highland Lakes Creative Arts accepts artist applications during its selection process. The Sculpture on Main celebration typically takes place in November, but you can enjoy the sculptures throughout the year. The Highland Lakes is fast becoming known as an arts destination, and Sculpture on Main is just one of the reasons why. From Burnet to Llano, back to Marble Falls, and down to Johnson City, if you like art, you’ve come to the right spot. Whether you’re looking for art galleries to browse or art shows to enjoy, there’s a little bit of everything. And don’t forget live music and theater. 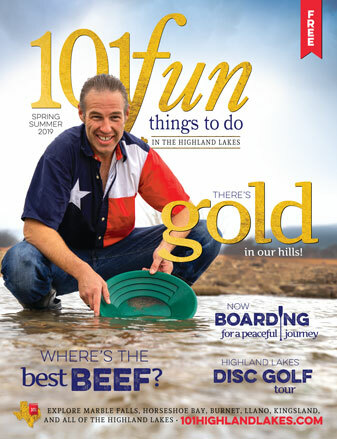 So just how do you get into the Highland Lakes arts scene? Well, start with some of the main art-centered events. 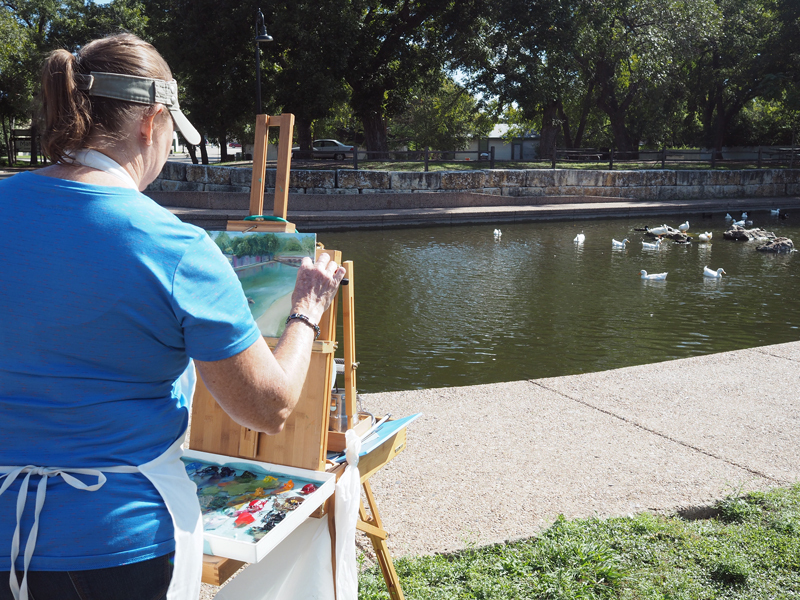 Burnet gets things rolling in the fall with the annual Plein Air Competition and Art Festival held in conjunction with the city’s Octoberfest. Plein art is just a fancy way of saying painting outdoors, and that’s just what you’ll find during the event. Artists fan out across Burnet and the surrounding area with their easels and paints to capture the essence and spirit of the place. A great thing about events such as the Plein Air Competition is, even though the artists are working on pieces for the competition, they always seem happy to visit with you. It’s a great opportunity to chat with artists and learn about their work. If you’re an artist yourself and want to enter the event, go to artburnet.com. Western Trappings on the Llano also begins in October. The exhibit celebrates the art and “trappings” of the Western lifestyle and heritage and can be viewed for several weeks at the Llano County Historical Museum, 310 Bessemer Ave. in Llano. While you’ll find amazing paintings of Westerns landscapes, portraits, and sculptures, you’ll also see saddles, intricate jewelry, silver spurs, and other items not always considered art. But these pieces are art. Just examine the craftsmanship poured into a handmade saddle or set of spurs, and you’ll see why. 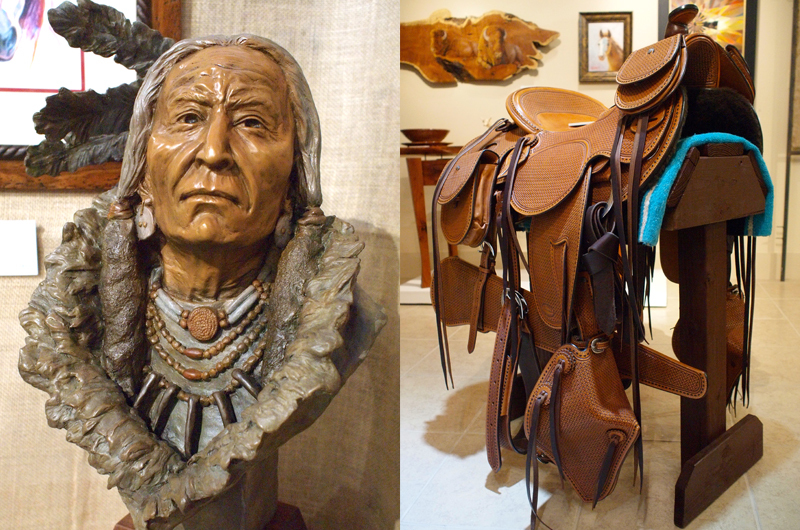 The Western Trappings on the Llano is one of the largest Western-themed art exhibits of its type in Texas. Artists from across the United States, Mexico, and Canada enter items in the show. If you see something you like, well, check the price because it’s probably for sale. Back in Marble Falls, new sculptures are unveiled in November. Art enthusiasts and sculptors organized the first Sculpture on Main in 2007 to promote Marble Falls and the Highland Lakes as an arts destination. And it worked: More and more people make their way to the area to revel in the arts scene. Sculpture on Main invites sculptors from across the area, state, and country to submit pieces for consideration and installment. 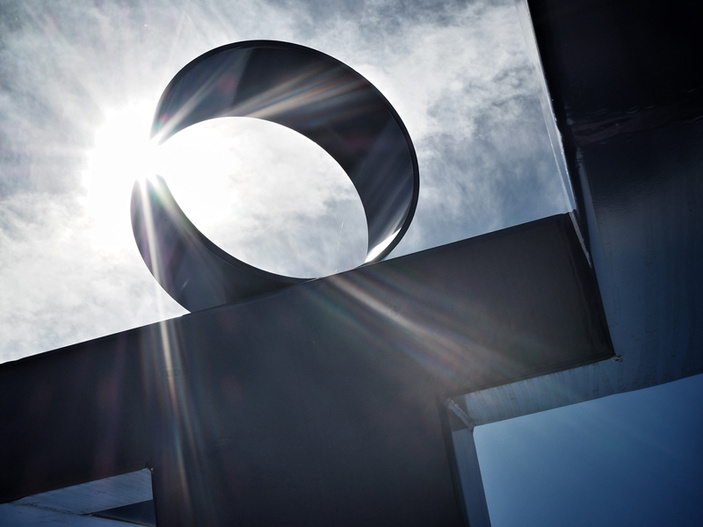 Once accepted and installed, the sculptures stay for two years before the next call for entries. If you’re exploring the Highland Lakes arts scene, don’t stop with these events. Visit its galleries (view listings to the right) or take part in a monthly art walk in Marble Falls, Llano, or Johnson City. A good resource is the local art guilds: Llano Fine Art Guild at llanofineartsguild.com; Highland Arts Guild at highlandartsguild.org; and Buchanan Arts and Crafts on Facebook. Other sources are the various galleries and artists. Some of our favorites are Marta Stafford Fine Art at martastaffordfineart.com (she throws an amazing Dia de los Muertos party in early November), Daniel Adams Fine Art Gallery at danieladams.org (he’s just an incredible artist), and Pogue Sculpture Gallery and Foundry at danpoguesculpture.com (he’s internationally renowned). If you’re looking for something a bit eclectic, check out Ralph Moresco’s West Shore Wind Spirals. His designs and kinetic sculptures will get the wheels in your brain turning, that’s for sure. How’s that for an arts scene? Buchanan Arts and Crafts Gallery, 17534 Texas 29 West in Buchanan Dam — Home to a cooperative of two dozen artists showing original arts and crafts. The gallery is open 10 a.m.-4 p.m. Wednesday-Saturday and 1-5 p.m. Sunday. Check out the Buchanan Arts and Crafts Gallery’s Facebook page or call (512) 793-2858. Daniel Adams Fine Art Gallery, 17617 Texas 29 East in Buchanan Dam — Daniel Adams is an internationally renowned artist. He's probably best known for his wildlife paintings but is adept at many styles and forms. His use of color really catches people's attention. Go to danieladams.org or call (956) 432-2262. Dan Pogue Sculpture Gallery and Foundry, 7670 RR 1431 East in Smithwick — The gallery features sculptures by artist Dan Pogue. The family-run facility gives guided tours by appointment, showing the creation process of the sculptures in addition to bronze casting. Go to danpoguesculpture.com or call (830) 693-9544. Highland Arts Guild and Gallery, 318 Main St. in Marble Falls — This cooperative encourages artists of all ages and abilities through classes, demonstrations, workshops, and exhibits. Gallery art includes paintings and sculptures in many media. Call (830) 693-7324. Galleries at Pecan Creek, located in Old Oak Square, 309 Main St. in Marble Falls — The gallery features artists from the Highland Lakes and surrounding area. It offers classes, meetings, shows, and other events. Open 10 a.m.-5 p.m. Tuesday-Saturday. Go to galleriesatpecancreek.com or call (830) 265-7725. Gridiron Gallery, 112 E. Main St. in Llano — Jack Moss brings the Western life alive with his realistic portraiture and lifestyle paintings. His vibrant water colors capture the people and places of the West. Go to gridirongallery.net, or call (830) 613-5570. Call for hours. Johnson City ArtWalk to galleries on Nugent Street in Johnson City — On the last Saturday of the month, enjoy a night on the town in Johnson City with art as the main focus. The monthly ArtWalk is 4-8 p.m. You'll get to check out art and drink some wine. Go to lbjcountry.com. Kingsland House of Arts and Crafts, 112 W. Chamberlain St. in Kingsland — It features a variety of handcrafted items and original art. Go to kingslandcrafts.com or call (325) 388-6159. Living Desert Ranch, 22701 Texas 71 in Spicewood — The studio, established in 1978, is known for its unique art, plants, and glasswork. Open 10 a.m.-5 p.m. Wednesday-Sunday. Go to livingdesertranch.com or call (512) 264-2830. 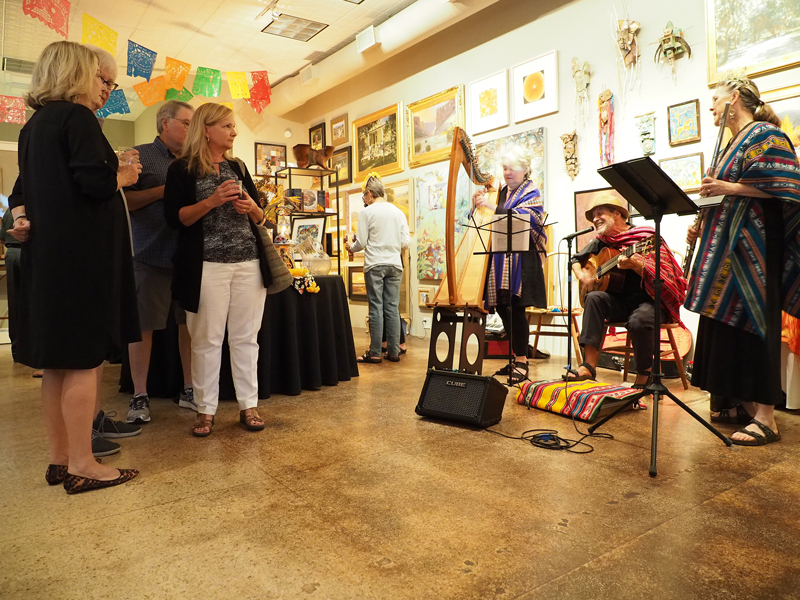 Llano Fine Arts Guild and Gallery, 503 Bessemer Ave. in Llano — The gallery showcases work by local artists in oils, watercolors, pastels, photography, ceramics, and sculptures as well as jewelry and gemstones. The gallery is open 10 a.m.-4 p.m. Thursday-Saturday and noon-4 p.m. Sunday. The guild holds demonstrations the first Monday of the month. Go to llanofineartsguild.com or call (325) 247-4839. Lou Quallenberg Studios in Llano — It specializes in commercial photography and contemporary mesquite wood furniture. If you'd like to check out the studio, call ahead to make an appointment at (325) 247-4304. Go to louqart.com. Marble Falls First Friday Art Walk — Stroll downtown Marble Falls along Main Street and enjoy art galleries and one-of-kind businesses during the First Friday Art Walk. It takes place the first Friday of each month from 5-8 p.m. Check out the Marble Falls First Friday Art Walk Facebook page or call (830) 265-7725 for up-to-date information. Marta Stafford Fine Art, 200 Main St. in Marble Falls — This award-winning gallery filled with a variety of artwork is for both the serious art lover and the beginning collector. Stafford also brings in artists throughout the year to demonstrate their work. Go to martastaffordfineart.com or call (830) 693-9999. Sculpture on Main along Main Street in Marble Falls — Sculpture on Main is a year-round public art program sponsored by Highland Lakes Creative Arts. You can enjoy the work of some of the best sculptors from Texas and beyond, and all you have to do is stroll down Main Street. Go to hlcarts.com. TASTE Wine + Art, 213 N. Nugent Ave. in Johnson City — The facility features wine tasting, a fine art gallery, and a sculpture garden. Open noon-5 p.m. Sunday and 11 a.m.-6 p.m. Friday-Saturday. Go to tastewineart.com or call (512) 851-8199. West Shore Wind Spirals at Buchanan Dam – Award winning artist Ralph Moresco translates his view of movement into kinetic sculptures. The pieces are created one at a time from copper, stainless steel, brass, and metal. To check out his work, call to see if the studio is open at (713) 898-9011 or check out westshorewindspirals.com.